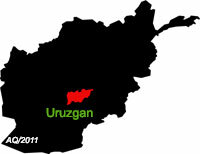 Afghan security officials say more than two dozen people have been killed and several others injured as government forces and members of the Taliban militant group engaged in fierce clashes in the country’s central province of Uruzgan. Aminullah Khaliqi, governor of Deh Rawood district, said on Wednesday that at least 10 members of security forces as well as 15 Taliban militants have been killed during skirmishes in the area, located 400 kilometers (248 miles) southwest of the capital, Kabul, over the past few days. He added that there were no civilian casualties as a result of the intense fighting. Khaliqi further noted that government troops will continue their counter-terrorism operation in Deh Rawood until the entire district is purged of Taliban members. The Afghan Defense Ministry said in a statement on Wednesday that 39 Taliban militants were also killed and 18 others injured in a series of operations carried out in the provinces of Helmand, Kunar, Kunduz, Laghman and Parwan. The statement added that nine Afghan soldiers were also killed during the offensives. Afghan government forces also confiscated light and heavy weaponry and defused several rounds of improvised explosive devices. Afghanistan is gripped by insecurity more than 14 years after the United States and its allies attacked the country as part of Washington’s so-called war on terror. YOU “MASS-MURDERING” ugly rats GET OUT OF AFGHANISTAN ! FALSELY BUT CLEALY PROCLAIM TO THE WORKD, “THE NECESSITY OF THEIR SAFETY ON DESTRUCTIVE ICCUPAION OF GREST LAND OF AFGHANISTAN”.